How Much is Your Honey? People are always telling me they are looking for good local honey. Whether or not I have any honey for sale is often the first question they ask when they find out I’m a beekeeper. I don’t think Kentucky beekeepers have come anywhere near saturating the market for locally produced honey. Lately, I’ve heard more and more beekeepers asking each other how much they charge for their honey. It’s a valid question because we all want to be fair to our customers and to ourselves – after all, beekeeping is hard work and not a cheap hobby. Bee Culture magazine and American Bee Journal both provide monthly honey market reports. However, their reports are at a regional level and may not fully capture what is happening at a smaller statewide scale. For example, I’ve heard that the going rate for a pound of honey at farmers markets a couple of hours away from where I’m located is as much as $2 more than what it is in my area. This month’s poll tries to get a feel for some of that price variance across the state. For the purposes of this survey, let’s limit our responses to liquid honey (not creamed honey or comb honey). This month’s poll is a little different than most of our past polls in that you may need to take it more than once. 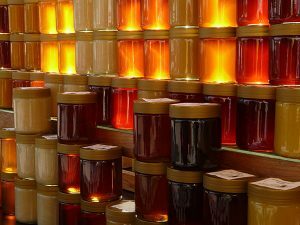 I recognize that honey prices may vary based on the type of location (farmers market, out of your home / office, retail store, etc.) where it is being sold. To capture that variance, please fill out a separate survey for each type of location where you sell your honey. The survey can be found below or you can take the survey online at https://www.surveymonkey.com/r/L59KFTM. All answers are completely anonymous. I’ll report the results in August.